I thought that the best way to kick off this month would be with an indisputable classic, Tod Browning's Dracula. One of the rules I set for myself this month is to stick with movies that I haven't seen before, and although every person who has heard of vampires can instantly picture Bela Lugosi in his most famous role, somehow I'd never seen this one. Do I need to tell you the plot? I don't need to tell you the plot. It's Dracula. Old school vampire, charming dude, suave dresser, likes blood and the ladies. Doesn't sparkle or brood like some emo teen with ridiculous hair. 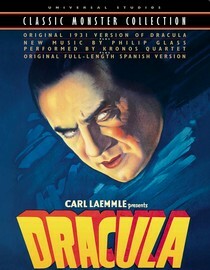 I'm glad that I finally watched Dracula; it's a foundational film, one of those that you've just got to see. Unfortunately, and through no fault of its own, that's also its weakness. This movie is almost 80 years old, and even if you've never seen it, you've seen it referenced, spoofed, remade, and rehashed a dozen different ways. Even though it was the granddaddy of 'em all, it still feels a little worn. There's part of the movie where Van Helsing (Dutch like me! Yay!) is blabbing about what must be done, and you see a shadow on the wall, and you know that at the time it was probably horrifying, but today it just makes you want to groan, "Dude - Rensfield is right f'ing there!" That's not to say that it didn't have its great parts, though. When Dracula makes his first onscreen appearance in his castle, even though I've seen the still shot of it more times than I can count, it was fantastic! My heart seriously jumped at Lugosi's menace and charisma. The part where Rensfield is journeying to Castle Dracula has amazing matte scenery, something you just don't see anymore in the age of greenscreen. And of course, one of the greatest lines in all of horror, when he's asked to join somebody for a drink - "I never drink... wine." It's all in the delivery. Dracula, I give you three bats out of five. I'm glad to finally have spent some time with you. Sweet Danny. I look forward to this series. Danny - this is great - my only "complaint" - when I read the paragraph that starts with "Do I need to tell you the plot?" I smiled big and then thought - I wish October was a longer month! I'm a huge horror movie fan. I'm going to look forward to these each day. Good pick to start with. Agreed that it's not the best film, though it's one everybody should see. @Mike - Thanks very much! Coming from the author of NTM, I kind of feel like I just got a compliment from a blog rockstar. @Will - I considered including it along with the other classics, but decided to include one I hadn't seen before instead. Just curious, did you ever see Shadow of the Vampire, based on the making of Nosferatu? The vampire character has a fantastic monologue. @Steve - Watching it felt like watching NBA footage from the '60s. You recognize the talent that Wilt Chamberlain and Jerry West had, and you realize that they're better than you'll ever be, but you also know that there's no way they could keep up in a league that includes LeBron and Kobe. Watching Dracula, I could see that the old guy had some moves, but he can't keep up in today's league. Danny, a better choice might have been Nosferatu. Excellent film, and it surprisingly holds up pretty well all things considered.